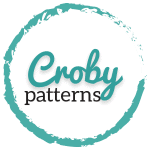 Croby Patterns is a personal blog written and edited by me. This blog accepts forms of cash advertising, sponsorship, affiliate links, or other forms of compensation. My time and effort are for sale, my opinions are NOT! I am occasionally compensated to provide an opinion, to write a review on products, services, websites and various other topics. The compensation received will never influence the content, I will always give my honest opinions, findings, beliefs, or experiences on those topics or products, good or not so good. The views and opinions expressed on this blog are purely my own (except comments written by others, which are their opinions). Those advertisements will be identified as paid advertisements. As the owner of this Croby Patterns blog, I reserve the right to refuse any advertisers that are deemed inappropriate for the content of this blog. Any personal information provided by an affiliate, sponsor, and/or advertiser will be kept confidential and will not be given or sold to third party vendors. All earnings from this blog go towards maintaining this blog and supporting my crochet business. If you have any questions, please contact me. For potential collaborations and sponsorships (product reviews, giveaways, pattern designs), please contact me and I can send you my media kit!